Congress seems to be living in some lala land where it is completely untouched from the increasing frustration among aam aadmi. I mean, we barely ever see the non-paid Congress supporters on social media. The paid ones, like Sanjay Jha and Poonawala, rarely ever have anything worth to say. And why would it be – UPA hasn’t left any saving grace for it’s spokespersons. There’ve been incidents of twitter-users being arrested for asking questions and expressing dissent. S Ravi last year was arrested when he asked that what’s the source of the wealth amassed by Chidambaram’s son and if there’s something fishy there too. Kapil Sibal’s cleverly-crafted draconian 66A was used against S Ravi, like several 100 cases which are old news for mass media now. We remember Shaheen Dhada, young girl from Mumbai who Shiv Sena goons taught a lesson by leveraging “helpless” local police officers. All this to teach the common man that what could be the consequences of “chhota munh badi baat”. Something very similar happened recently at one Aditi Restaurant in Mumbai. 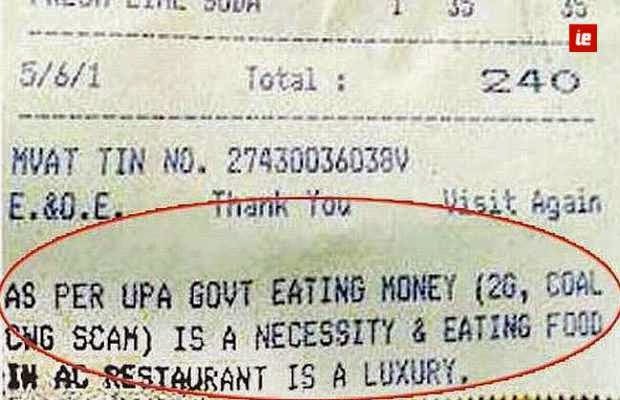 Another politically aware small business owner – who creatively showed his frustration by putting a sharp comment about corruption in UPA government on his restaurant’s bill. Congress Youth wing was very quick – and very proudly stood for his party and closed down the restaurant illegally. 1. Congress, which proudly proclaims itself the savior of democracy and secularism – is no different from right wing goons like Shiv Sena and VHP. There source of motivation could be different. For right wing there’s jingoist-fascist-flavored-nationalism – whereas for Congressis it’s sheer sycophancy. Nevertheless, none of these will think twice before reminding aam aadmi his true place, or as north Indians say ‘aukat’. As a matter of fact, they will use laws made to protect public against the public, oh the irony! 2. Social media is not something that’s just used by upper-middle class snobs who never vote. Today what reflects on social media can fairly tell the mood on the ground, and election results in 2013-14 will elaborate this fact for everybody. Quick updates on new news and detailed analysis of old news – don’t let aam aadmi forget anything anymore. Political class can’t suppress tiny voices as if they never existed. We all saw how one small restaurant closed using political clout in some suburb – and the whole country started buzzing. 3. Real world activism is still a scary jungle – where muscle is still big currency. Vague laws like defamation can be quoted anywhere to harass “free” citizens. Freedom of speech and civil liberties – can’t just be achieved by writing a petition, making a Facebook page or sending a 200 tweets. We have seen how so many RTI activists died for a simple demand to peek into the “democratic” Govt’s working. Recently long-time activists and newly formed AAP’s candidate Santosh Koli was attacked for the tenth time – and she barely escaped death. Stronger voices need to stand behind common people and facilitate this long over due awakening. Leaders like Arvind Kejriwal and Prashant Bhushan stood behind Autorickshaw drivers – and now they have become this enviable unstoppable force against corrupt Delhi government. 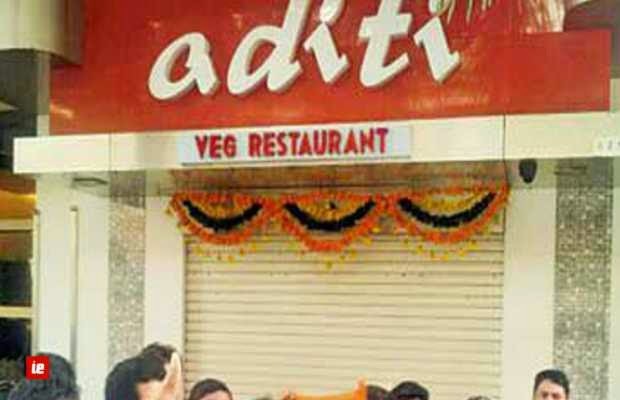 The owner of Aditi Restaurant needs to be applauded for exercising his right to freedom of expression. Congress goons may call it defamation and inflammation – that is immaterial. Our country has become a country where if you call a thief a thief – there’s a good chance that the thief will use his dirty money to sue you and will win. And if that can’t be done – he can always beat the crap outta you. This needs to be changed. Immediately.